This bright bag for a young girl is made with home deco fabric with a cute fairy themed print. Another unique fabric found by my mother at the Bowerbird Boutique opportunity shop in Euroa, Victoria. 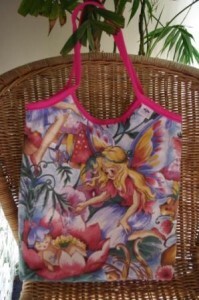 The bag is lined with the butterfly fabric used in the Butterfly ensemble. I use magnetic snaps in my tote bags.